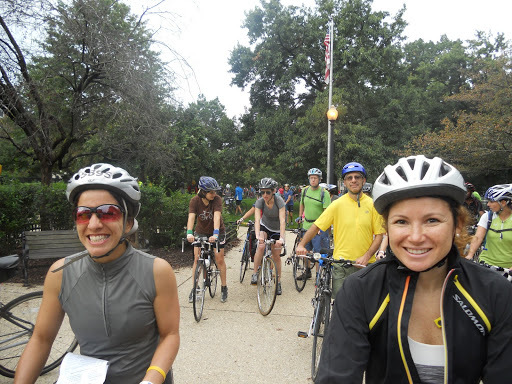 The Fifty States Ride takes place each year in Washington, D.C. The idea is to ride on each of the streets named for the fifty states. The 65-mile course is designed to cover the entire city. If you want to know what DC really looks like, this ride is for you. 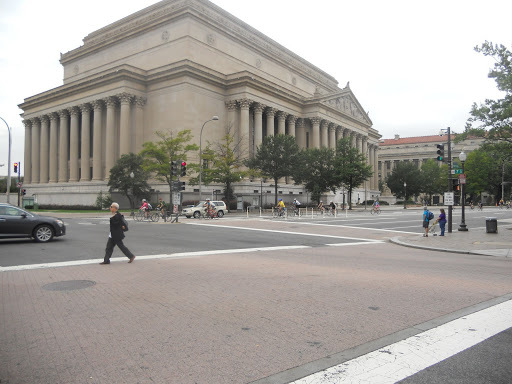 The streets are open to auto traffic so it is just you, your wits and a cue sheet against the topography of our nation’s capital. 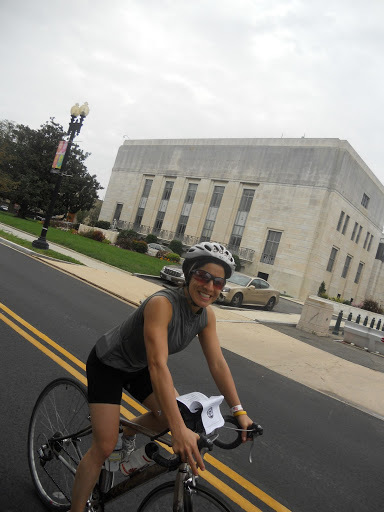 Did I mention DC is hilly? Yeah buddy! Is it ever! What makes the ride especially challenging is the fact that at the bottom of nearly every hill is a stop sign or a traffic light. No hill hopping here. This is why I call this ride the Hell of the Mid Atlantic. 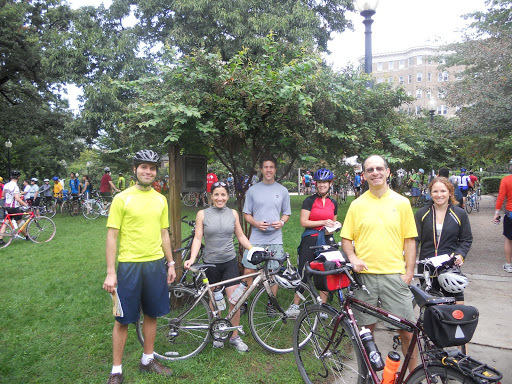 Originally, the ride was held in August which meant 90+ degree temperatures. Apparently this was too much fun so they moved it to September when the humidity is only slightly uncomfortable. Spending so much time at a standstill makes this an incredibly social ride. 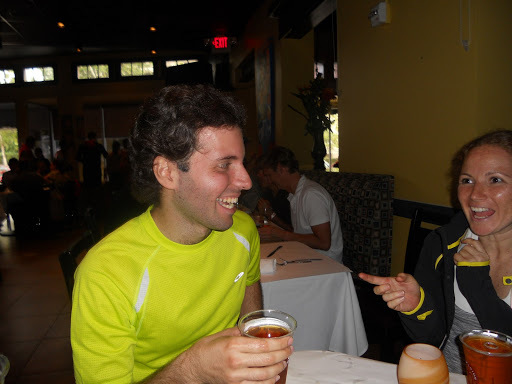 Riders strike up friendships throughout the course. 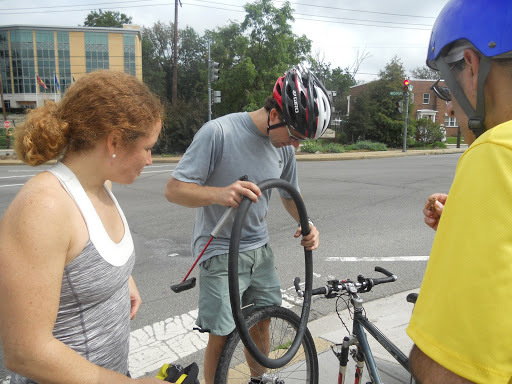 The residents of DC, often accused of hostility toward cyclists, offer encouragement, course corrections, and sometimes food and water to the riders. Who says this city has no heart? 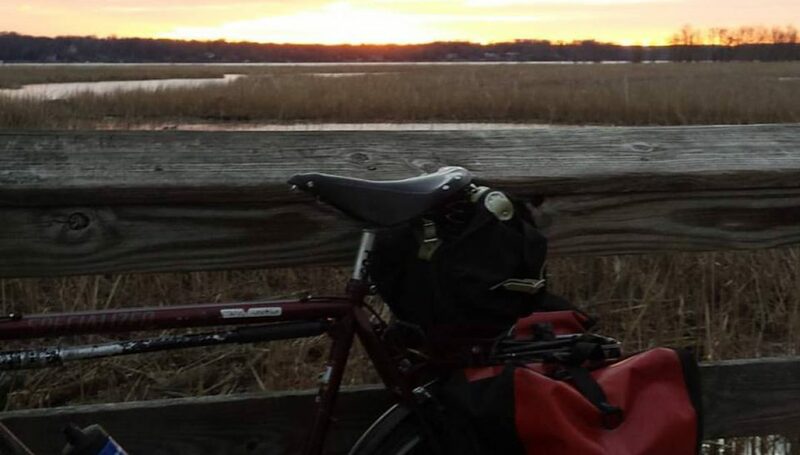 After last year’s ride, I decided to retire from the Hell of the Mid Atlantic. Three times is plenty. It’s too hard. I’m too old. Then came Florencia. I met Flor on my first ride five years ago. She seemed to float up the hills and, despite truly oppressive heat and humidity, she didn’t seem to break a sweat. It was so gross out that at least one rider decided to take a dip in Rock Creek, which can’t be the cleanest urban waterway in the world. 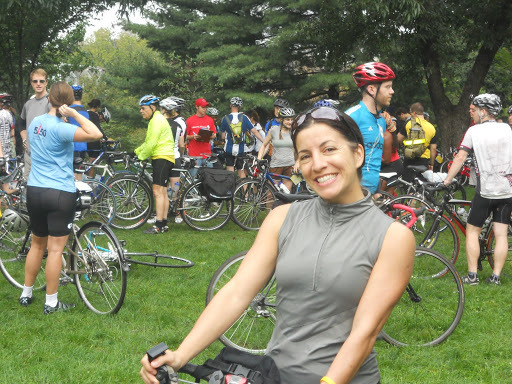 Using Facebook, Flor put out the call to her 2,642 personal friends for riders to join her for this year’s ride. Jeff, who I met through Shane who rode with Flor and me way back in 2007, signed up first. Then another Jeff who I didn’t know. Then Richard. And Veronica. Finally, my friend Paul, who also rode with us in 2006 joined in. Veronica’s friend Amy came too. The Florbook Seven was formed. Our social director was pleased with herself. Wipe that smile off your face, Paul. At the start I saw Lisa, a rider from work. And Mary whom I met last year. And her husband Ed. (Two nights earlier I attended an Elbow concert at the 930 Club in DC only to find myself standing next to Mary and Ed. Small world.) Mary also blogs and we both post pictures on Flickr. 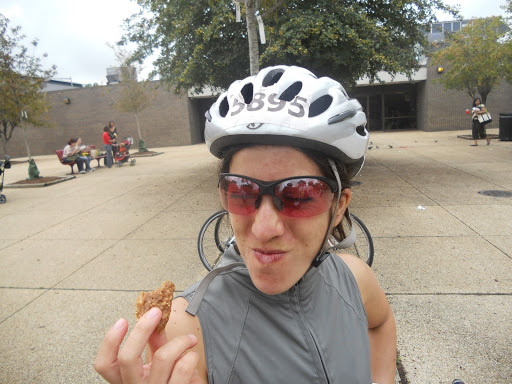 You can check out her blog entry on the Fifty States Ride here. Mary and Ed went off with some of their friends. And Lisa with hers. The Florbook Seven set out together alone. 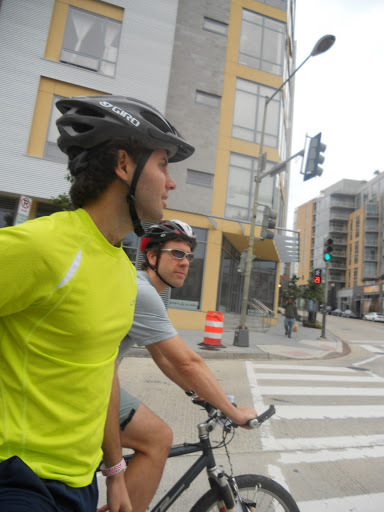 The ride corkscrews its way around downtown and Capitol Hill for what seems like forever. The riders pick off a dozen or so states as they follow their cue sheets, hoping not to make a wrong turn. Speeds are slow and talk flows. At this point I took lots of pictures knowing full well that the hills are not too far away. 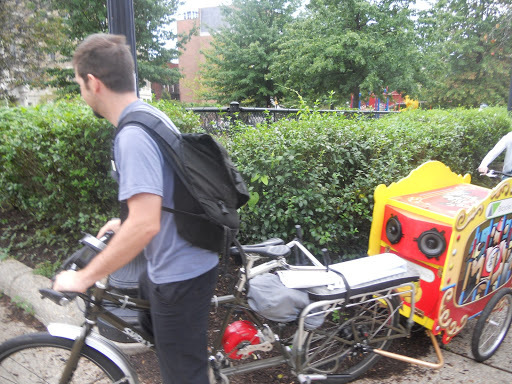 This guy hauled a music wagon with his massive bicycle. And so we rode, and stopped, and rode, and stopped. 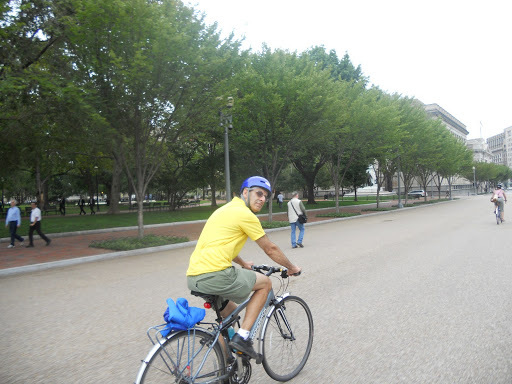 Eventually we passed the White House along a car-free section of Pennsylvania Avenue. Occasionally, we fanned out on the route. 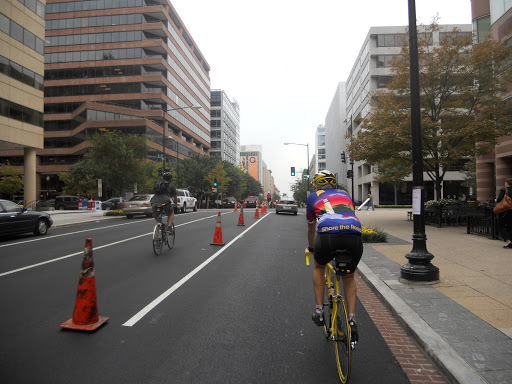 Along Pennsylvania Avenue, I opened up a sizable gap so I waited for the crew to catch up near the Archives. Somewhere along this section Veronica confessed a misconception. 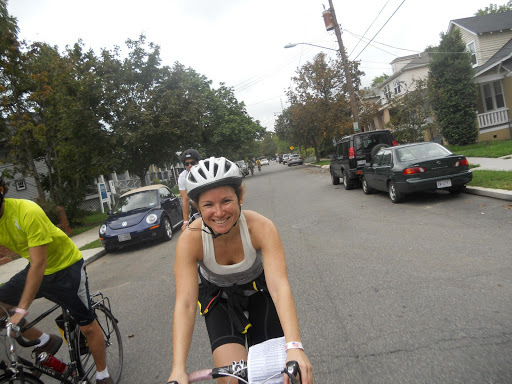 When she signed up, she thought it was a 50-mile ride. Her longest previous ride had been 40 miles. She didn’t look too pleased, but I assured her that we’d get her through to the end. She seemed like a pretty determined rider, the weather was good, and we were riding at a pretty casual pace so she seemed confident that she’d make it. 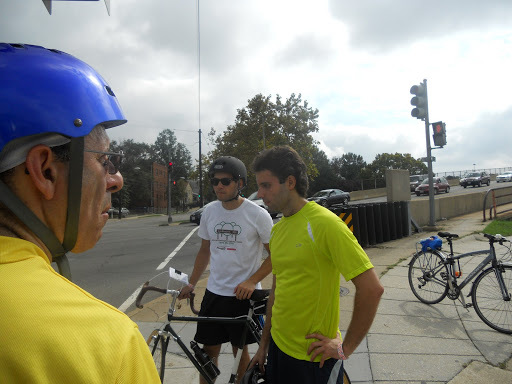 We made our way out of downtown and across the Anacostia River to scenic Anacostia. That’s sarcasm, folks. Anacostia is poverty stricken and the riding here is hilly. Up Martin Luther King Boulevard. Down Alabama Avenue. Up Stanton Road, Mississippi Avenue, and more of Alabama. 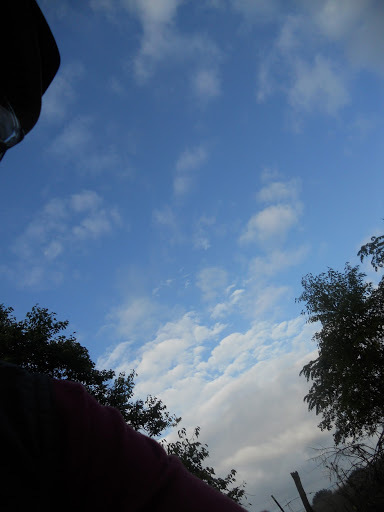 The crew stopped for a breather but I pedaled on slowly not wanting to stiffen up. They caught up to me at a light about a mile later, all remarking on that last monster hill. 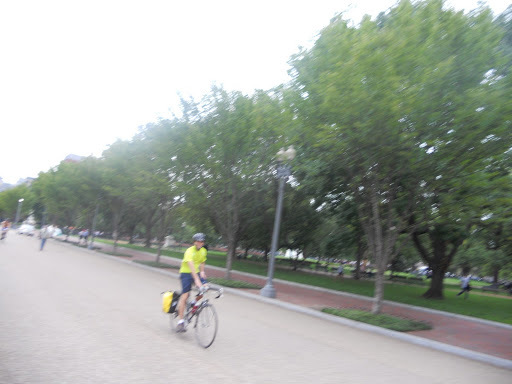 Payback came on Massachusetts Avenue as we all glided at thirty miles per hour back toward the river. 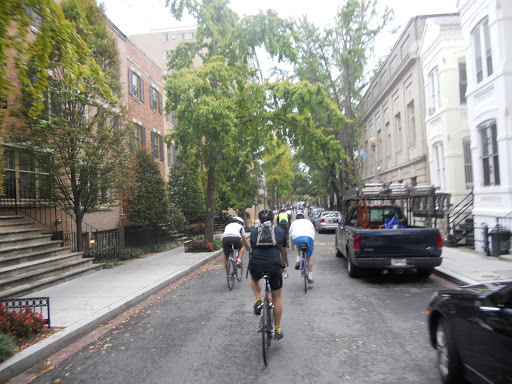 We cruised through Capitol Hill and stopped at Eastern Market, near the half way point. Here Flor and Paul re-enacted some pictures I took five years ago. Somehow the only pictures I have of Flor from that ride are of her eating. She offered Paul some tasty looking chocolate, which was actually soap. Paul was tempted. 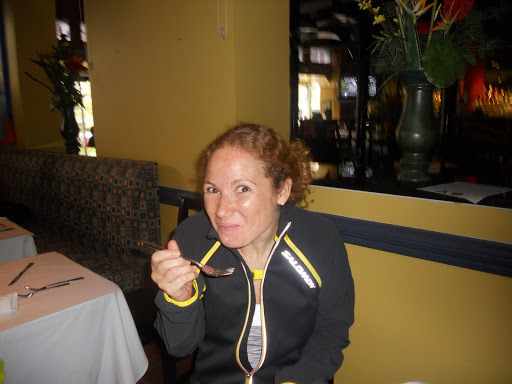 Florencia eating – Are Powerbars food? 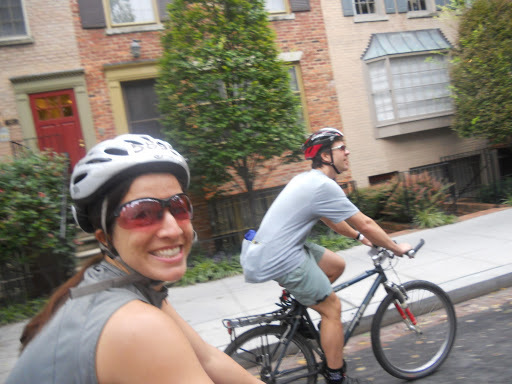 After eating at Eastern Market, Florencia and Amy decided to head home. This is not entirely surprising since we had already been riding for four hours. The rest of us, devoid of real lives, decided to continue on. We were joined by Tito who had been riding alone. Poor Tito was lonely. Now we were Veronica and Her Boys. After Eastern Market the course opens up quite a bit and the pace improves. We took turns leading the group. Richard the Young rode like a colt. He was such a strong rider that he seemed to be constantly riding past turns. He came back to us time and again. No worries. Since I was a three-time veteran, I led during some of the more confusing sections. Mostly I hoped the group would follow when I surged ahead to get some momentum for a hill coming up. Lucky for me, my legs seemed to get stronger as the ride went on. Veronica and Paul watch Jeff checking his tube. Jeff had our second flat of the ride (Amy had one in the morning). He tried to find the cause but gave up and re-installed the suspect tube. Fearing that he’d flat again and delay us, he rode on ahead alone. Jeff, the noble one. Paul, Tito and Richard contemplate the universe. Well past the forty mile mark, Veronica seemed to have no problem with the hills. I took a shot of her over my shoulder. For somebody who expected to be miserable, she sure looks like she was having a good time. Maybe it was the fact that the cue sheets were running out. 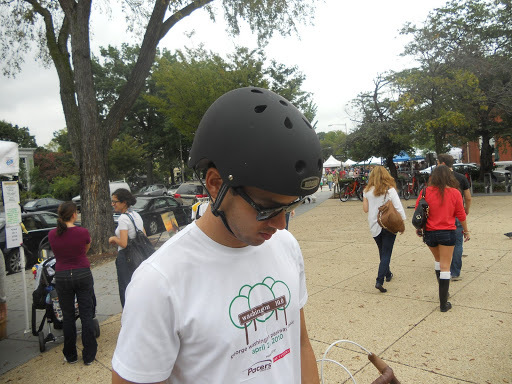 We escorted our fair lady through the far northern section of the city and down into Rock Creek Park. 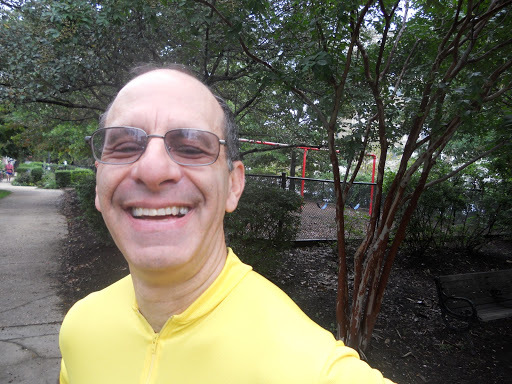 In Chevy Chase, Richard stopped to ask a woman on her front lawn for some water. Without hesitation they agreed. Then they asked the rest of us if we wanted some too. Nice people. 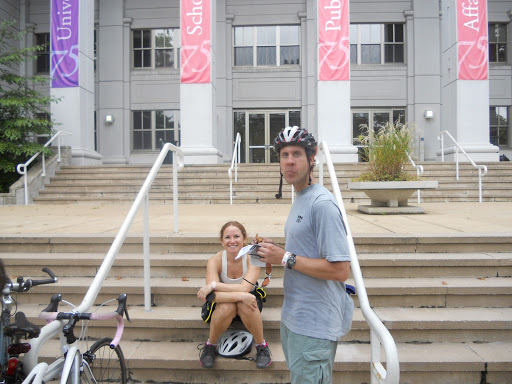 The last rest stop was at American University. After that would come the dreaded Arizona Avenue hill, steep, bumpy, and long. Veronica steeled herself for the challenge while Tito called his next of kin. Veronica with Jeff at AU. No worries. Tito on his smart phone. I am proud to report that Veronica and her boys passed the Arizona Avenue challenge unscathed. I managed to make a wrong turn a few miles later but corrected my error so that we might enjoy the thrill of riding on Idaho Avenue. 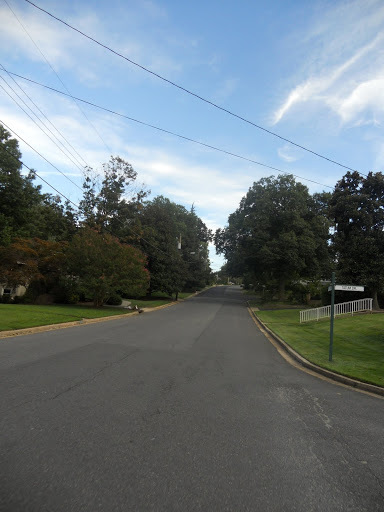 About 15 minutes later we arrived back where we started at Kalorama Park. 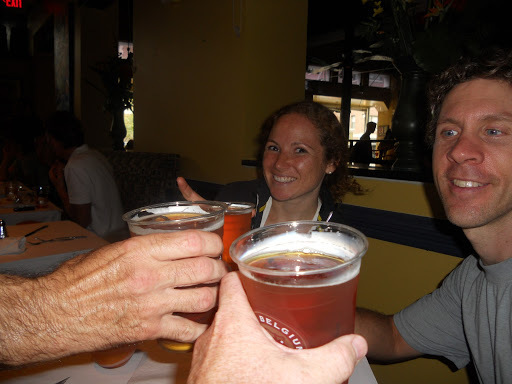 We crowded into The Grill from Ipanema across the street and commenced celebrating. The boys were proud of their Lady. Richard seemed utterly unphased. 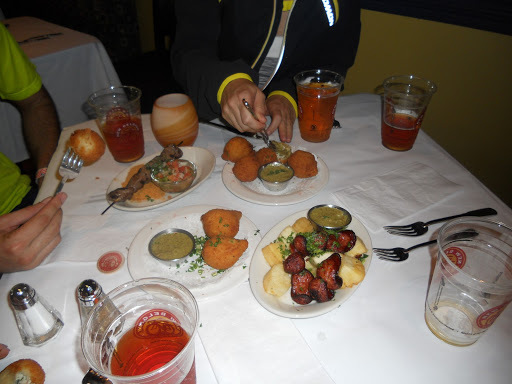 We toasted our triumph with cold beer and ate some pretty darn awesome Brazilian food. Good food. Great ride. New friends. 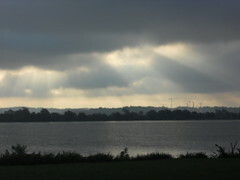 Bike Commute 107: Sun and Clouds over the Potomac, a photo by Rootchopper on Flickr. It’s nearly October now. That means we’ll be getting some interesting sun rises and sun sets. This shot was taken after sunrise from Gravelly Point near National Airport. It being my first day in the office at my new job, the beams of sunlight made me feel optimistic. Is This the Perfect Day Ride? Today, for the second year in a row, I woke up at 5:30 and drove over an hour. To do a bike ride. In 50 degree temps. Am I nuts? Well, yes, but that’s beside the point. 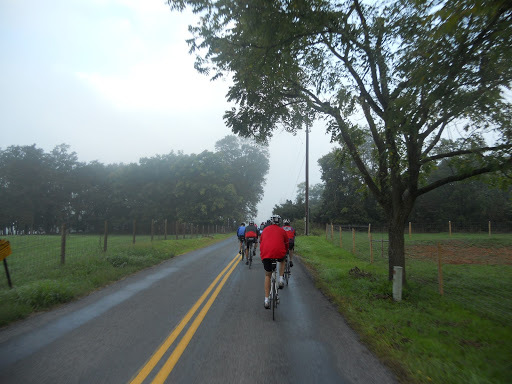 The occasion for my early rumblings was the Potomac Pedalers’ Backroads Century in the Shenandoah Valley. 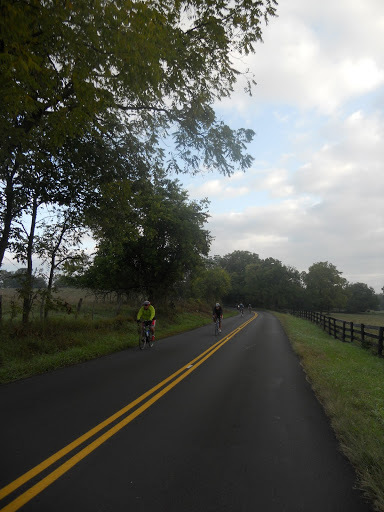 Since I am a bit of a weenie, I rode the metric century, a 65-miler squeezed in between Berryville, Wincester and Front Royal, Virginia. 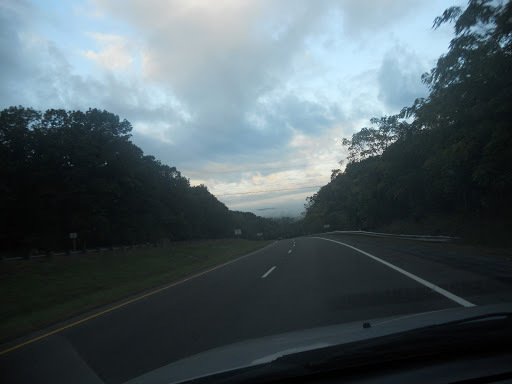 As I drove my car over the crest of the Blue Ridge, I could see a layer of thick fog covering the valley below. 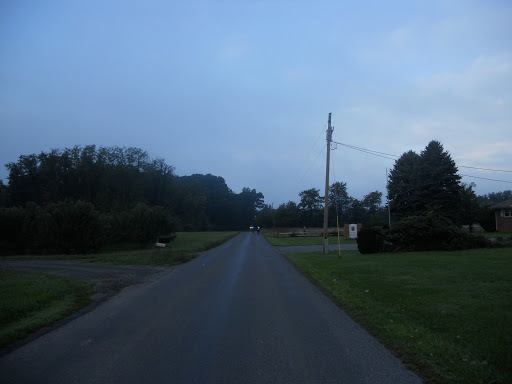 A half-hour later I was riding through the fog with my red blinky light on. Not that it was necessary. Most of the local drivers were still sleeping off their Saturday night. 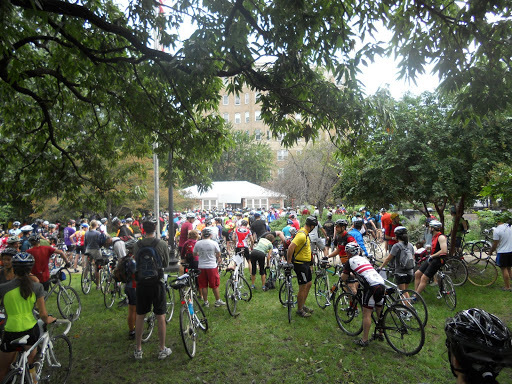 2,000 participants rode one of five different courses. You could choose between 25, 30, 50, 65 and 100 miles. 65 miles is just the right balance between pleasure and pain for me. 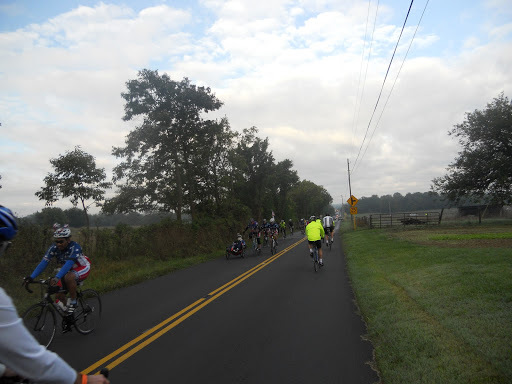 After the waves of R2R riders, it was just the 2,000 of us banging out the miles. For the most part, the hills were nice rollers, allowing hill hopping. To hill hop, you ride fast down one hill and use your momentum to cruise up the next. In my younger days, I could do this for hours. Still it’s fun to defy the climbing gods for a morning. There were a few challenging hills to climb. This is only fair since they almost always were followed by a screaming downhill. I topped out at a little over 40 miles per hour. I don’t know which hill that was on, because, frankly, I think it makes more sense to watch the road than my speedometer. And of course there were many miles with nothing but flat easy riding. Most of my riding is to and from work on a narrow bike bath, so I rarely get my speed going above 13 miles per hour. On this ride I could easy bring my cruising speed up to 18 miles per hour. This may not sound like much but my 1993 Specialized Sequoia is quite a tank (and I make a weighty turret). The cool temps lasted for about half the ride. I hate to see the summer heat go but I was comfortable wearing my commuting vest over a long t-shirt. My only real discomfort was cold toes caused by my wet shoes and socks. That fogs settles into dew and I walked through wet grass every time I got off my bike. Sorry about the paucity of pictures. If I took a shot of everything I found interesting or scenic, I’d still be out on the course. I didn’t even take a shot of a cow and there were hundreds along the route, cheering us on with their vigorous chewing. And I passed up beaucoups barns too. You didn’t expect me to stop on a downhill for that, did you? This is my favorite ride in the mid-Atlantic. It’s right up there with the Erie Canal west of Rochester, the Great Allegheny Passage through Ohiopyle State Park in Pennsylvania, the Maui downhill ride from the rim of Haleakala to the sea, and the ride through the Presidio across the Golden Gate Bridge to Sausalito, If you live in the DC area, you really owe it to yourself to do this ride at least once. Bicycle Weather Vane, a photo by Rootchopper on Flickr. I took today off. After lollygagging about the house all morning, I went down to Indian Head, MD for a leisurely ride. The weather gods were in a good mood so I had a nice 25 mile spin. At the eastern end of the trail I came upon this clever and appropriate weather vane. All along the trail were subtle signs of extensive flooding from recent tropical storms. Tall grasses were bent over and painted with a fine coating of mud. Trees had fallen across the trail and had been cleared in haste leaving horizontal trees bowing toward the trail. 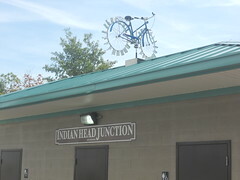 If you live around here and have never ridden the Indian Head Rail Trail, you should give it a go. There are some wonderful wetlands along the trail that are often filled with beautiful water fowl. And, if you are lucky like I was today, you might roust a hawk at rest in the tall trail-side grass. 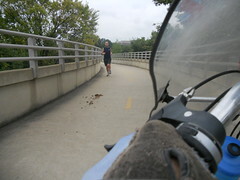 Bike Commute 102: Poo!!! !, a photo by Rootchopper on Flickr. The perils of bike commuting are without number. Inattentive, aggressive, impaired, incompetent drivers ought to be enough to worry about. Or that occasional jogger who does a button hook into your path. Or even the little kid or dog or squirrel who darts out into your path. These are all minor problems compared to the dreaded pile of poo! Nobody expects the pile of poo. Then it appears. And you hope you have quick enough reflexes to avoid it. Otherwise, the dreaded pile of poo might leave a bad taste in your mouth – especially if you’re riding a recumbent and are low to the ground. 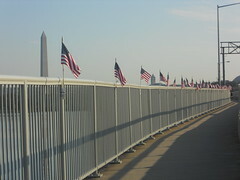 Bike Commute 100: Flags , a photo by Rootchopper on Flickr. 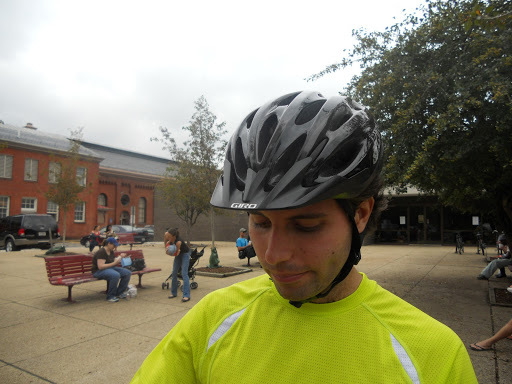 Today was my 100th bike commute of 2011. My Sequoia was in the shop so I rode my comfy Tour Easy recumbent to work. Apparently somebody realized that this was the big 1-0-0 and they put up scores of American flags on the railing of the 14th Street Bridge. Or maybe the flags had something to do with September 11th. 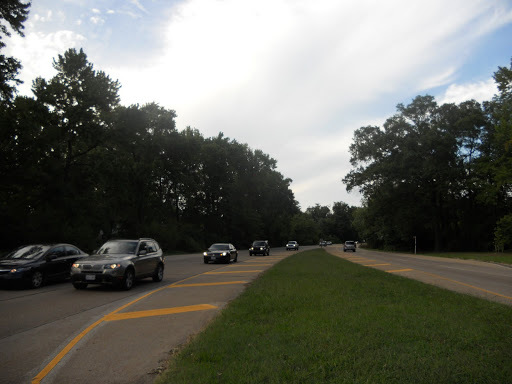 Like last year, and 2009, and 2008…..
Bike Commute 97: What’s a Cubit? Those of us who live in the Mid-Atlantic and Northeastern United States have seen enough rain in the last few weeks to turn us all pruney. (How do you spell that anyway?) Yesterday I drove for 6 hours from Westport. Connecticut to DC in a driving rain. From what I could tell, New Jersey might as well be renamed Lake Jersey at this point. Delaware, Maryland and Virginia are no better. Five minutes after leaving home this morning, the skies opened up. Within a minute or two I was soaked to the bone. All day I could look out my office window and see downpour after downpour. Just before leaving for home I checked the weather radar on the Internet. It showed massive rain straight up the Chesapeake Bay and Potomac River. Thinking “no guts, no glory” I headed out. As it turned out the skies were kind. I rode through a little light rain here and there but nothing too bad. The real problem was on the ground. Puddle after puddle after puddle all the way home. Many were so big that I pulled my feet off the pedals and rode through like a little kid. 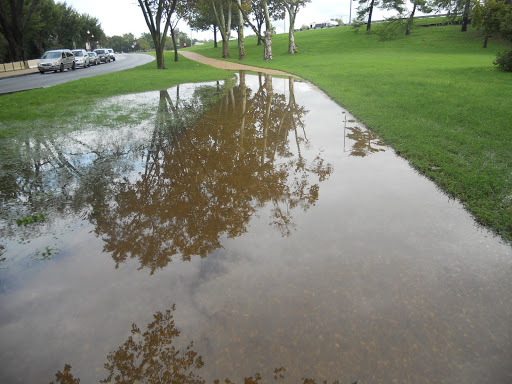 Here’s the kind of puddle I am talking about. It’s supposed to continue raining for the next several days. I’m thinking I better figure out what a cubit is. The fall event riding season fast approaches and despite logging a gajillion miles this year I am feeling woefully slow and old. And that’s before I get on my bike. A summer of too many Yeunglings, I’m afraid. One of the fall events is the Hell of the Mid-Atlantic. 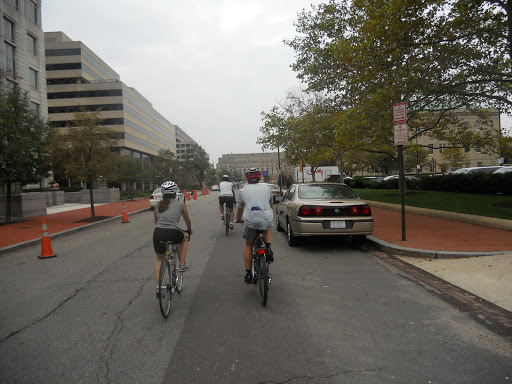 This ride is officially called the 50 States Ride The route careens around the District of Columbia like a drunk with the whirlies. It’s a concept ride. Roads bearing the names of all 50 states in all 8 wards of the city are included. Only in DC is Rhode Island big and Texas tiny. It’s actually a very clever 63-mile route mapped out by the Chief Masochist at the Washington Area Bicyclists Association . As you do the ride you go to every nook and cranny in the city. It really gives you an appreciation for the economic, social, ethnic, and topographical diversity of the city. Did I mention topography? Let me put it this way. DC is a lot hillier than you think. And at the bottom of every hill is a red light. So when you do this ride you pretty much start climbing hill after hill after hill from a dead stop. 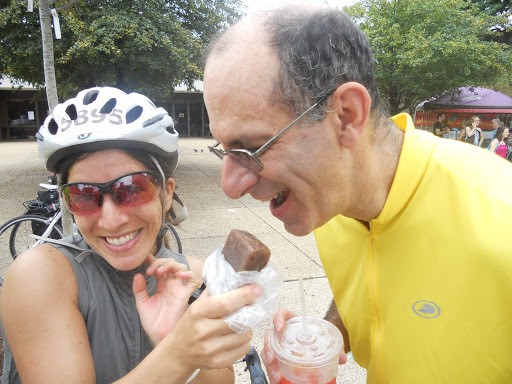 I am once again doing this ride with my friends Jeff and Florencia. Jeff is a triathlete. He is nice enough to go slow so that he can chat with me while I am gasping for air. He drinks fruit smoothies during rides. Florencia is a rock climber who also does acroyoga. Basically she is unaware that gravity is a law of nature. She climbs hills on a bike like a spider on a wall. I climb hills on a bike like a bison with lumbago. I am thinking of bringing a lasso and throwing it around her on Kansas Avenue so that she can tow me to the top. She only eats almonds during rides. 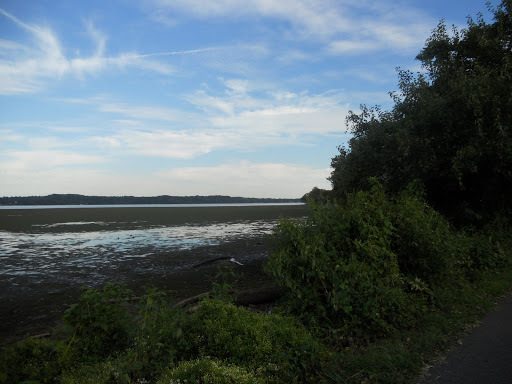 As I was coming home I enjoyed the flat, calm and scenic ride along the Potomac for 12 miles. As if to get me revved up for the hill to come, I had to cross the George Washington Parkway at rush hour. The Park Service cleverly place a traffic island in the middle of the road so I could wait for 10 of 20 thousand speeding cars to rush by. Without this island I’d either still be out there waiting or lying on the side of the road with the rest of the flattened critters. I made it across thanks to an act of God. Then I hit the hill. I swear it’s a big hill. See, can’t you tell. Hey, wait. That looks easy. Damned camera. Try this picture instead. Okay. So maybe it doesn’t look like much of a hill, I can assure you that cameras can be deceiving. 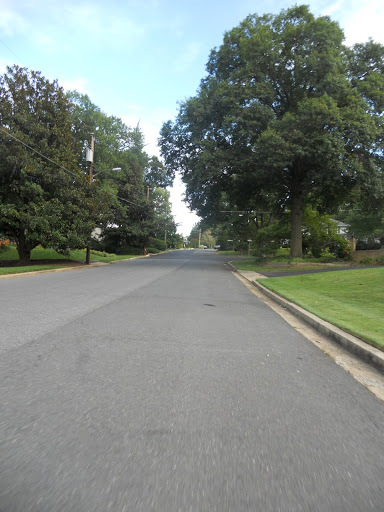 I figure if I ride this every day for three weeks, I’ll be in great shape to tackle Alabama Avenue SW. Sadly there is another 50 miles of hills after that. I may end up dead on the road in Anacostia but I’ll be damned if I’m going to my grave with a fruit smoothie and a fistful of almonds in my belly. If you put your ear next to my mouth, you’ll no doubt hear me say, “Ice cold Yeungling” just before I die.